See also the page on royal styles. Most of the information here is from Thomas Woodcock and John Martin Robinson: The Oxford Guide to Heraldry, Oxford University Press, 1990, with some corrections. See also Roger Forder's page on the royal arms of England. The arms of England (gules three lions passant guardant or) are known since their appearance on Richard Lionheart's second great seal, although he is believed to have used either a lion rampant or two lions affrontes before that (as shown on his first seal), and his father Henry II to have used a lion rampant. His younger brother John had a 1177 seal with two lions passant guardant. In 1340 Edward III asserted his claim to the kingdom of France through his mother Isabelle de France, sister of the last three kings in the direct Capetian line, against their first cousin Philippe de Valois, closest heir in male line, who had succeeded in 1328. Although Edward III was not heir general (i.e., if one allowed female succession, there were other candidates closer than he was), he and his successors spent a lot of time (one hundred years by the conventional count) trying to conquer France, coming close to success many times but ultimately failing. The claim was expressed by quartering the arms of England with those of France, with France in quarters 1 and 4. According to Froissart, this was done to assuage the Flemings who were bound by oath not to act offensively against the king of France. if Edward were to take the title, they said, they would acknowledge him as such and offer him assistance. The quarter of France was a semy of fleurs-de-lys or (see the discussion of French royal arms) and changed to three fleurs-de-lys in 1405 or 1406 to reflect French practice. (The seal of Henry IV had a semy, but the arms on his tomb have three fleurs-de-lys, and the future Henry V bore three fleurs-de-lys on his arms as prince of Wales starting in 1405; the seal of Henry V had three fleurs-de-lys). Interestingly, these quartered arms came to be regarded as the arms of England itself, as distinct from those of France. When Henry VI was crowned king of France in Paris in 1422, pursuant to the Treaty of Troyes of 1420, he minted coins with two escutcheons side by side, France and England (that is, France quartering England; see Ruding's Annals of Coinage 1840, vol. 1. p. 267). In 1603 James VI of Scotland ascended the throne of England, and the following year changed his style to that of king of Great Britain. 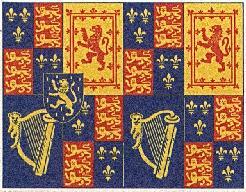 The royal arms became: grandquarterly, 1 and 4 quarterly France and England, 2 Scotland, 3 Ireland (Henry VIII had proclaimed himself king of Ireland in 1541 but the kingdom's arms had not yet been incorporated into the royal arms). The Great Seal of Scotland, from 1603 to the present, has retained the same arrangement as the English/British royal arms, but with Scotland in place of England, and England in place of Scotland. The coinage of James VI and I initially showed the same arms (England 1 and 4, Scotland 2, Ireland 3) but an act of the Privy Council of 7 Dec 1609 decided to make the coinage minted in Edinburgh show the arms as they appeared on the Great Seal of Scotland (Scotland 1 and 4, England 2, Ireland 3). While William reigned alone after Mary's death he used his arms, as above. Queen Ann, Mary's sister, returned to her father's arms as they had been used from 1603 to 1688. 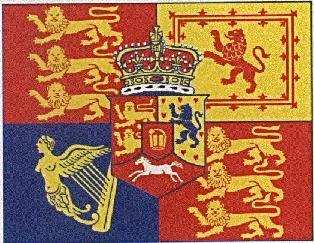 The Act of Union united the kingdoms of England and Scotland; this union was signified by a rearrangement of the arms. The united kingdom was represented by England and Scotland impaled in quarters 1 and 4, France in quarter 2 and Ireland in quarter 3. For the first time, the quartered arms (gules three lions passant guardant and azure three fleurs-de-lys or) ceased to be regarded as a single coat representing England. Instead, France was treated as if it were one of the crown's other dominions like Ireland. Note that article 24 of the Union with England Act of 1707 states that "[...] a Seal in Scotland after the Union be alwayes kept and made use of in all things relating to private Rights of Grants which have usually passed the Great Seal of Scotland and which only concerns Offices, Grants, Commissions and private Rights within that Kingdom". The design of the seal was left to the sovereign. Accordingly, a different seal and achievement is in use in Scotland to this day. The accession of the House of Hanover brought yet another modification. The fourth quarter, identical to the 1st until 1714, was replaced with the arms of Hanover: tierced per pale and per chevron, 1: gules two lions passant guardant or (Braunschweig), 2: or a semy of hearts gules a lion ram,pant azure (Lüneburg), 3: gules a horse courant argent (Westfalen), over all an escutcheon gules charged with the crown of Charlemagne or (dignity of arch-Treasurer of the Holy Roman Empire). Majesty's Royal Commands may be punctually observ'd and obey'd therein accordingly. The duke of Braunschweig-Lüneburg had titled himself "Elector of the Holy Roman Empire" from 1698, and added an escutcheon gules and an electoral bonnet to his arms. From 1711 he also bore the title of Arch-Treasurer and the escutcheon was charged with a crown of Charlemagne or (see his coinage in Gerhard Welter, Die Münzen der Welfen). After 1714, his German coinage bore the title: "Georgius I Dei Gratia Magnae Britanniae Franciae et Hiberniae Rex, Fidei Defensor, Brunscvicensis et Luneburgensis Dux, Sacri Romani Imperii Archithesaurarius et Elector". That it be the first Article of the Union of the Kingdoms of Great Britain and Ireland, that the said Kingdoms of Great Britain and Ireland shall, upon the 1st day of January which shall be in the year of our Lord 1801, and for ever after, be united into one Kingdom, by the name of The United Kingdom of Great Britain and Ireland; and that the royal style and titles appertaining to the Imperial Crown of said United Kingdom and its dependencies; and also the ensigns, armorial flags and banners thereof shall be such as H. M. by his Royal Proclamation under the Great Seal of the United Kingdom, shall be pleased to appoint. Accordingly, a Proclamation of Jan. 1, 1801 set the royal style and titles and modified the arms, dropping the quarter of France. The Annual Register (vol 43, p. *2) states that the new great seal was shown to his Majesty and the privy council on that day. Note, however, that article 24 of the Union with England Act of 1707 was not modified, and that a separate seal for use in Scotland continued to exist. Art. 10 of the Act of Union (Ireland) provides: And the great seal of Ireland may, if his Majesty shall so think fit, after the union be used in like manner as before the union except where it is otherwise provided by the foregoing articles, within Ireland, and his Majesty may, so long as he shall think fit, continue the privy council of Ireland, to be his privy council for Ireland. The Irish Free State Act 1922 (13 Geo. 5 Sess. 2 c.2), sch. 1 para 2(4) states: "There shall be a Great Seal of Northern Ireland which shall be kept by the Governor of Northern Ireland and shall, after the first appointment of such Governor, be used for all matters for which the Great Seal of Ireland was theretofore used. Until a Great Seal of Northern Irealdn is provided the private seal of the Governor of Northern Ireland may be used as that Great Seal." The office of Governor of Northern Ireland was abolished in 1973, but I do not know what became of the Great Seal. There is a story that the quarter of France was dropped to satify the demands of Napoleon at the peace of Amiens (J. H. Pinches, Royal Heraldry of England), or "in compliance with one of the articles of the Treaty of Paris" (Oxford Guide to Heraldry, p. 189). These claims are rather fanciful, since the Treaty of Paris dates from 1783, and the Treaty of Amiens was signed in March 1802; neither treaty making any mention of the matter. The claim to the throne of France was recognized by many as silly, especially since, as of 1792, there was no throne of France to claim (although Britain had yet to recognize this in international law; it did so with the treaty of Amiens). Furthermore, the one who did claim it, the comte de Provence and future Louis XVIII, was actually living in London at the time. There is, however, a kernel of truth to the story. In 1797, after the Austrians had signed a peace with France, Great Britain was left without major allies in its war against France, and war-weary. Peace negotiations were begun, during the "conference of Lille" from July to October 1797, with Lord Malmesbury as the British negotiator. The internal politics of France, however, were very volatile, with tensions between several of the five-member executive (the Directory) holding a much more radical line then others, and also in conflict with more moderate and peace-inclined parties in the legislature. As a result, the French negotiators laid down exorbitant demands (including the return of the Channel Islands!) and continually hindered the negotiations by raising time-consuming and insubstantial problems. Eventually, a coup took place in France in October 1797, with the radicals gaining the upper hand, and the negotiations were broken off. "They [the ministers plenipotentiary of the French Republic] have positive orders to require the renunciation of the title of king of France borne by his Britannic majesty. Lord Malmesbury is requested to observe that the question is not only one of renunciation of the rights which might be pretended to be derived from this title, but further and formally of the title itself. The establishment of the French Republic, and the acknowledgement of this form of government by the king of England, will not allow of his retaining a title which would imply the existence in France of an order of things which is at an end." (Parliamentary History, vol. 33, p. 925-6). "[...] one of the French plenipotentiaries began, by saying, that in the preamble of the treaty the title of king of France was used; that this title they contended could no longer be insisted on, the abolition of it was in a manner essential to the full acknowledgement of the French Republic, and that as it was merely titular as far as related to his majesty, but quite otherwise in the sense in which it applied to them, he hoped it would not be considered an important concession. [...] It was to the title, as well as to any right which might be supposed to arise from it, that they objected. I could scarce allow myself to treat this mode of reasoning seriously. I endeavoured to make them feel that it was cavilling for a mere word; that it was creating difficulties where none existed; and that if all the French monarchs in the course of three centuries had allowed this to stand in the preamble of all treaties and transactions between the two countries, I could not conceive, after its having been used for so long a period without any claim or pretension being set forth in consequence of it, how it could now affect either the dignity, security, or importance of the republic–that in fact such titles have ever been considered as indefeasable, and as memorials and records of former greatness, and not as pretensions to present power–and I quoted the titles of the kings of Sardinia and Naples, &c. as examples exactly in point. I argued however in vain. They treated it very gravely, and made so strong a stand upon it, that I could not avoid taking it for reference, which I though it better to do, than feeling as I did at the moment, to push the conversation further." (Parliamentary History, vol. 33, p. 917). "The chancellor of the exchequer had called his majesty's title of king of France, a harmless feather. In his [Dr. Laurence's] opinion, no ancient dignity, which for so many centuries had shed lustre on the English crown, ought to be considered as a mere light, unsubstantial ornament. It was bound up indissolubly with the honour of the nation. If we suffered that feather to be plucked, he feared that three other feathers, which were nearly connected with the crown, and were gallantly won in the same glorious wars by which we first asserted the claim of our monarchs to that harmless feather, would soon follow; the crown, and the throne itself, would hardly be secure. A great nation can never safely be disgraced" (ibid., p. 1021). Such feelings are echoed in the Annual Register's description of the change of title in its 1801 edition (vol. 43, p. 38). "In preparation for the legislative union between Great Britain and Ireland, which was to take effect at the beginning of the present year, government adopted several essential measures. The style of the King undergoing a necessary alteration, the opportunity was embraced of resigning that which had been held for so many ages, the glorious attestation of British valour, the title of "King of France." This sacrifice of national pride was not so unimportant as many would represent; it was a concession made to fortunate usurpation, which no legitimate monarch had ventured to insist on, it argued a diminution in the national feeling of self-importance, which was but too consistent with the spirit of the times; yet, circumstanced as the nation was at the period of the making the alteration, it was the most prudent course which could be adopted. The executive directory, feeble and justly contemned as they were, had during the negotiation at Lille insisted on the renunciation, and there was no probability that the consular government, more fortunate and respected, and apparently more firm, would, in any future treaty, omit to make a similar requisition. The nation, desirous of peace, could hardly endure to hear of a protracted war, with all its attendant expences, for the sake of a mere title; and ministers, aware of this fact, acted discreetly in yielding to the evident temper of the times, and making by their own choice, a change which might otherwise have been extorted on the demand of the enemy, reinforced by the clamour of the people." "Emperor of the British Dominions"? "His late Majesty, George III, was advised, at the time of the Union with Ireland, in compensation for H.M.'s abandonment, then voluntarily made, of the title of King of France, which had been so long annexed to the Crown of England, to assume the title of Emperor of the British and Hanoverian Dominions; but his late Majesty felt that his true dignity consisted in his being known to Europe and the world by the appropriated and undisputed style belonging to the British Crown." of Elector of the Holy Roman Empire. The Powers who concurred inthe Peace of Paris having agreed by the 6th Art. Empire has ceased to be suitable to  present circumstances. his Royal Highness to consent. his Sovereign, the title of King of Hanover. metternich the assurances of his distinguished consideration. Vienna, Oct. 12, 1814. (signed) Count Munster. and Ireland, King of Hanover, Duke of Brunswick and Luneburg, &c.
faithful subjects and public authorities to employ in future and all acts, &c.
of the reign of his Majesty, our Father. 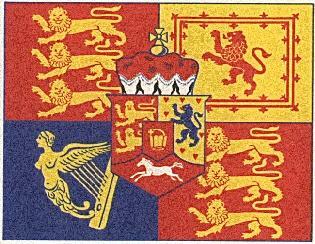 Curiously, the royal arms were not changed until 2 years later. A proclamation of Jun 8, 1816 ordered that the royal Hanoverian crown be placed over the escutcheon of pretence, instead of the electoral bonnet. With the accession of Victoria in 1837, the kingdom of Hanover went to another line by application of the Salic law, and the Hanover escutcheon disappeared (see the proclamation of July 26, 1837). The medieval crown used by the English kings was an open crown flory, like that of other kings. The seals of Edward VI and Richard III show a single "inverted-V" arch topped with a globe and cross, as does that of Henry VII who also adopted the crown on his coinage. It is under Henry VIII that crosses alternate with the fleurs-de-lys, but the number of arches was not set; the coinage of Charles II clearly shows two smaller arches supporting the main one. James I, privy seal: "a crown of five points"
James II, privy seal: "a crown of nine points, fleur-de-lis and trefoils"
Mary of Guelders, queen of James II: "open crown of 8 points, strawberry leves and pearls alternately"
Margaret, queen of James IV: "arched crown"
Mary, counterseal: "arched close crown of fleur-de-lis and crosses patt?e, the arches meeting and terminating in a ball surmounted with crosses patt?e"